I was tired and cold and grumpy this morning. I had been planning to make another frittata, but I wasn’t that motivated. 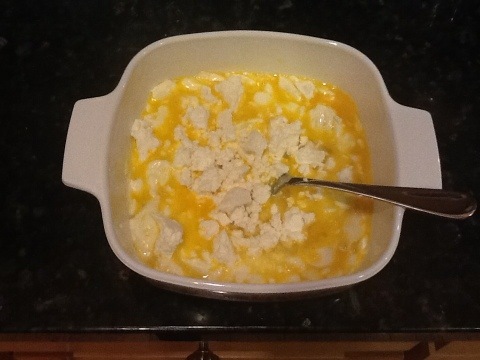 Then I remembered a breakfast dish I hadn’t made in awhile – cheesy eggs. This is a variation on the Mock Danish recipe, which can be made sweet or savory. 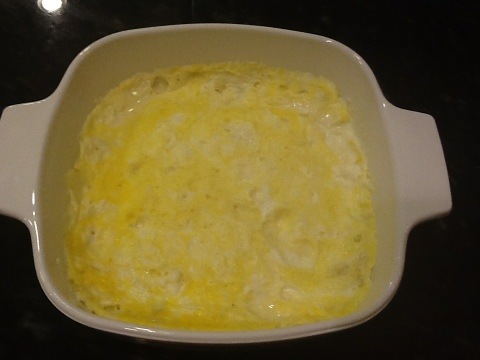 Place Neufchâtel cheese in a covered casserole dish and microwave on 50% power for one minute to soften the cheese (I almost said microwave-safe casserole dish, but I’m not one to insult my readers’ intelligence). Add remaining ingredients and mix with a fork. Microwave on full power for 4 min or until the middle sets. Serves 2. 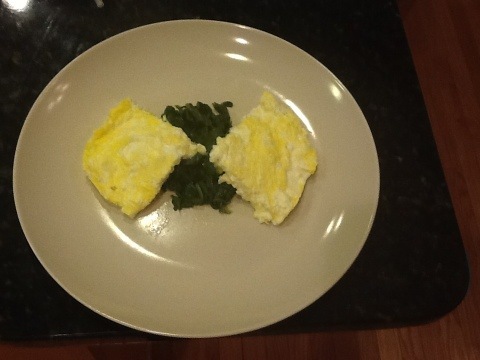 I ate mine with some leftover mustard greens. Comments: The challenge was to eat out at every meal, preferably at new places to me, and try to stay Primal at every meal. Going out for breakfast and lunch is impractical (and actually undesirable) for me on a workday. Tom and I are going out to dinner this weekend, so maybe I can try this then. Comments: not sure if I am wimping out or just being prudent at this point, but I was afraid to risk making my back worse. Hardest part: Not sure I’ve seen a direct benefit for myself from the diet. Since I’ve already lost the weight it’s hard to measure tangible results. Comments: I have been spreading the word already at work, with my family, with a close friend, my Facebook friends and through this blog. I’m not trying to convert anyone to Paleo. What I would like people to discover is how delicious a whole food diet can be, and that is is doable with our modern lifestyles. Jewel flipped through the Primal Blueprint Reader Created Cookbook, and she said that so many of the recipes sounded good to her. She said she’d try anything except the spicy recipes! So stay tuned next week when we’ll try Paleo shepherd’s pie. I’m so excited that you are going to try going Primal! The food tastes fantastic, and the only grains I miss at all are oatmeal and beer. Glad I could help inspire you! Eggs cooked this way are very, very good. Thought you’d like finding those in the warming drawer after your run!